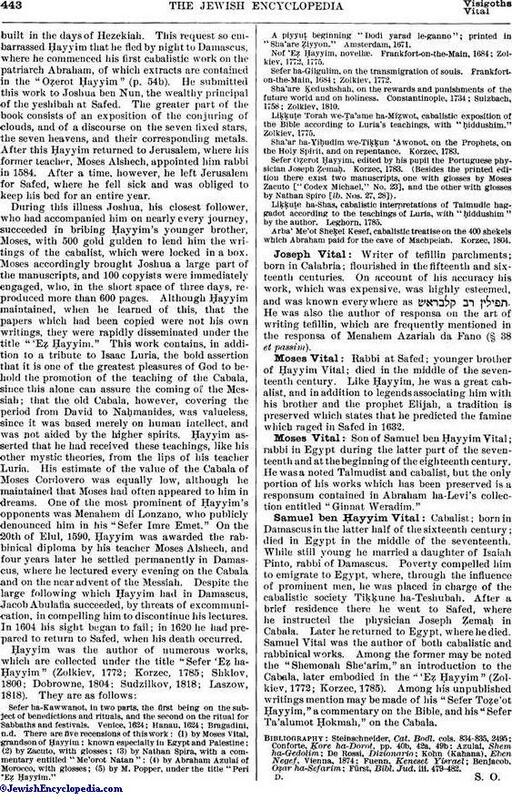 Cabalist; son of Joseph Vital; born at Safed in 1543; died at Damascus May 6, 1620. He was educated by Moses Alshech. His biography is full of legends; at the age of twelve, it is said, he was told by a chiromancer that when he reached the age of twenty-four years he would find himself standing before two roads, and would rise or fall according to his choice. Joseph Caro is said to have paid especial attention to Ḥayyim's talents by requesting Alshech in 1557 to take great pains with the education of a pupil who was destined to succeed his teacher in the world of learning. In the same year Ḥayyim became acquainted with Lapidot Ashkenazi, a cabalist, who was to influence him for the remainder of his life. The legend runs that after Ḥayyim's unhappy marriage to Hannah, the daughter of a certain Moses Saadia, the prophet Elijah appeared to him in a dream and led him to a beautiful garden, where he beheld the pious of all ages in the form of birds flying through the garden and studying the Mishnah. In the center of the garden was God Himself, seated on a throne and surrounded by the pious on rich tapestries. This vision convinced the dreamer that he was destined to become a cabalist. After devoting himself to the study of alchemy for two years and a half, he had another vision of the prophet Elijah, who told him that he would succeed in his studies and would even write a commentary on the Zohar. In 1570 he became a pupil of Isaac Luria, and before he had studied under him a year Ḥayyim had already become known as one of the foremost cabalists, so that when, in 1572, Luria died at the early age of thirty-eight, in an epidemic which raged in Safed, Ḥayyim became his successor. Luria had left nothing in manuscript, and his pupil accordingly began to commit to writing what he had learned from his teacher. In 1576 he commenced to give cabalistic lectures, declaring himself to be the Messiah ben Joseph; and while wandering through Syria and Egypt, he is said to have performed many miracles, such as summoning spirits before him by the power of magic formulas. In 1577 Ḥayyim arrived in Egypt, but evidently he met with a cool reception, since he soon returned to Palestine, where he settled, first in the little town of 'Ain Zaitun, and later in Jerusalem. There he remained until the governor, Abu Saifia, requested him to rediscover, by means of the Cabala, the aqueduct, leading from the River Gihon, which had beenbuilt in the days of Hezekiah. This request so embarrassed Ḥayyim that he fled by night to Damascus, where he commenced his first cabalistic work on the patriarch Abraham, of which extracts are contained in the "Oẓerot Ḥayyim" (p. 54b). He submitted this work to Joshua ben Nun, the wealthy principal of the yeshibah at Safed. The greater part of the book consists of an exposition of the conjuring of clouds, and of a discourse on the seven fixed stars, the seven heavens, and their corresponding metals. After this Ḥayyim returned to Jerusalem, where his former teacher, Moses Alshech, appointed him rabbi in 1584. After a time, however, he left Jerusalem for Safed, where he fell sick and was obliged to keep his bed for an entire year. During this illness Joshua, his closest follower, who had accompanied him on nearly every journey, succeeded in bribing Ḥayyim's younger brother, Moses, with 500 gold gulden to lend him the writings of the cabalist, which were locked in a box. Moses accordingly brought Joshua a large part of the manuscripts, and 100 copyists were immediately engaged, who, in the short space of three days, reproduced more than 600 pages. Although Ḥayyim maintained, when he learned of this, that the papers which had been copied were not his own writings, they were rapidly disseminated under the title "'Eẓ Ḥayyim." This work contains, in addition to a tribute to Isaac Luria, the bold assertion that it is one of the greatest pleasures of God to behold the promotion of the teaching of the Cabala, since this alone can assure the coming of the Messiah; that the old Cabala, however, covering the period from David to Naḥmanides, was valueless, since it was based merely on human intellect, and was not aided by the higher spirits. Ḥayyim asserted that he had received these teachings, like his other mystic theories, from the lips of his teacher Luria. His estimate of the value of the Cabala of Moses Cordovero was equally low, although he maintained that Moses had often appeared to him in dreams. One of the most prominent of Ḥayyim's opponents was Menahem di Lonzano, who publicly denounced him in his "Sefer Imre Emet." On the 20th of Elul, 1590, Ḥayyim was awarded the rabbinical diploma by his teacher Moses Alshech, and four years later he settled permanently in Damascus, where he lectured every evening on the Cabala and on the near advent of the Messiah. Despite the large following which Ḥayyim had in Damascus, Jacob Abulafia succeeded, by threats of excommunication, in compelling him to discontinue his lectures. In 1604 his sight began to fail; in 1620 he had prepared to return to Safed, when his death occurred. Sefer ha-Kawwanot, in two parts, the first being on the subject of benedictions and rituals, and the second on the ritual for Sabbaths and festivals. Venice, 1624; Hanau, 1624; Bragadini, n.d. There are five recensions of this work: (1) by Moses Vital, grandson of Ḥayyim; known especially in Egypt and Palestine; (2) by Zacuto, with glosses; (3) by Nathan Spira, with a commentary entitled "Me'orot Natan"; (4) by Abraham Azulai of Morocco, with glosses; (5) by M. Popper, under the title "Peri 'Eẓ Ḥayyim." A piyyuṭ beginning "Dodi yarad le-ganno"; printed in "Sha'are Ẓiyyon." Amsterdam, 1671. Nof 'Eẓ Ḥayyim, novellæ. Frankfort-on-the-Main, 1684; Zolkiev, 1772, 1775. Sefer ha-Gilgulim, on the transmigration of souls. Frankfort-on-the-Main, 1684; Zolkiev, 1772. Sha'are Ḳedushshah, on the rewards and punishments of the future world and on holiness. Constantinople, 1734; Sulzbach, 1758; Zolkiev, 1810. Liḳḳuṭe Torah we-Ṭa'ame ha-Miẓwot, cabalistic exposition of the Bible according to Luria's teachings, with "ḥiddushim." Zolkiev, 1775. Sha'ar ha-Yiḥudim we-Tiḳḳun 'Awonot, on the Prophets, on the Holy Spirit, and on repentance. Korzec, 1783. Sefer Oẓerot Ḥayyim, edited by his pupil the Portuguese physician Joseph Ẓemaḥ. Korzec, 1783. (Besides the printed edition there exist two manuscripts, one with glosses by Moses Zacuto ["Codex Michael," No. 23], and the other with glosses by Nathan Spiro [ib. Nos. 27, 28]). Liḳḳuṭe ha-Shas, cabalistic interpretations of Talmudic haggadot according to the teachings of Luria, with "ḥiddushim" by the author. Leghorn, 1785. Arba' Me'ot Sheḳel Kesef, cabalistic treatise on the 400 shekels which Abraham paid for the cave of Machpelah. Korzec, 1804. Writer of tefillin parchments; born in Calabria; flourished in the fifteenth and sixteenth centuries. On account of his accuracy his work, which was expensive, was highly esteemed, and was known everywhere as . He was also the author of responsa on the art of writing tefillin, which are frequently mentioned in the responsa of Menahem Azariah da Fano (§ 38 et passim). Rabbi at Safed; younger brother of Ḥayyim Vital; died in the middle of the seventeenth century. Like Ḥayyim, he was a great cabalist, and in addition to legends associating him with his brother and the prophet Elijah, a tradition is preserved which states that he predicted the famine which raged in Safed in 1632. Son of Samuel ben Ḥayyim Vital; rabbi in Egypt during the latter part of the seventeenth and at the beginning of the eighteenth century. 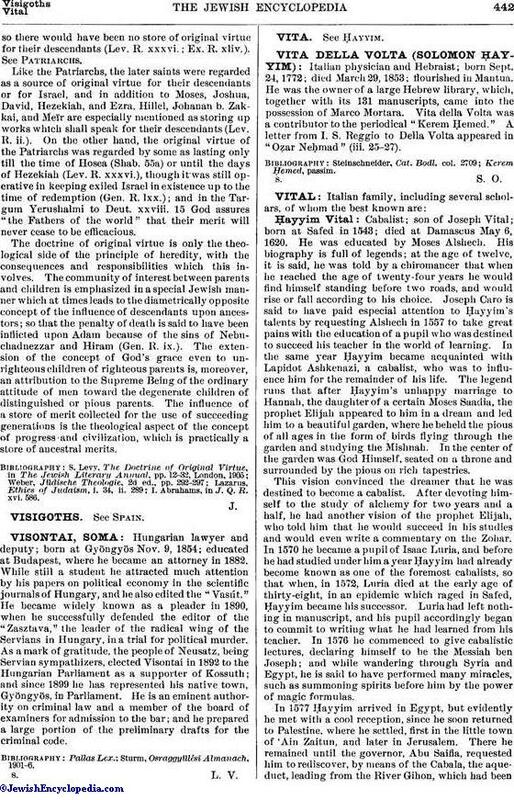 He was a noted Talmudist and cabalist, but the only portion of his works which has been preserved is a responsum contained in Abraham ha-Levi's collection entitled "Ginnat Weradim." Cabalist; born in Damascus in the latter half of the sixteenth century; died in Egypt in the middle of the seventeenth. While still young he married a daughter of Isaiah Pinto, rabbi of Damascus. Poverty compelled him to emigrate to Egypt, where, through the influence of prominent men, he was placed in charge of the cabalistic society Tiḳḳune ha-Teshubah. After a brief residence there he went to Safed, where he instructed the physician Joseph Ẓemaḥ in Cabala. Later he returned to Egypt, where he died. Samuel Vital was the author of both cabalistic and rabbinical works. Among the former may be noted the "Shemonah She'arim," an introduction to the Cabala, later embodied in the "'Eẓ Ḥayyim" (Zolkiev, 1772; Korzec, 1785). Among his unpublished writings mention may be made of his "Sefer Toẓe'ot Ḥayyim," a commentary on the Bible, and his "Sefer Ta'alumot Ḥokmah," on the Cabala. Fürst, Bibl. Jud. iii. 479-482.